While the T-14 Armata might be Russia’s latest and greatest tank, it still is not ready for service. While the T-14 Armata might be Russia’s latest and greatest tank, it still is not ready for service. In order to bolster the capabilities of the more conventional tank fleet while the Armata is being prepared, Russia continues to modernize its current “top-tier” tanks, such as the T-90. Unlike earlier generations of Russian tanks, the T-90M has practically every feature that modern Western tanks enjoy. While earlier tanks sometimes lacked an independent commander thermal sight, instead only having independent commander day and night sights, the T-90M mounts the PK-PAN independent commander sight. The gunner’s sight is also thermal — the now-standard Sosna-U module. Both of these sights appear to still use the French Catherine thermal matrices, there is no indication that the Russian Irbis-K thermal modules have been implemented in the T-90M as it will be procured. These two sights are linked, with the tank’s information-management system able to pass a target designated by the commander directly to the gunner. Russian sources state that this is the first time such a feature has been implemented on a domestic tank. However, this has been a standard feature of Western tanks for some time. 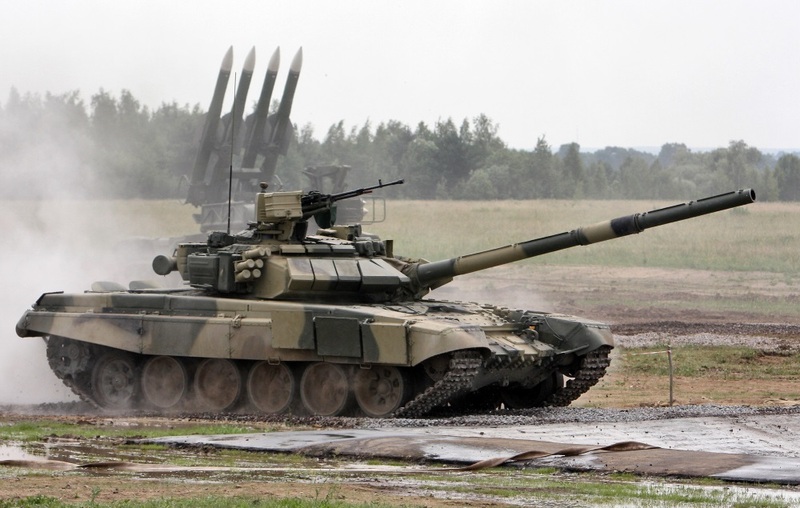 The Kontakt-5 explosive-reactive armor on earlier T-90s is replaced by the more effective Relikt. Some kind of net or chain armor appears to be deployed under the turret Relikt packages to decrease the effectiveness of HEAT shots to that area. While earlier photos of the T-90M showed slat armor in this area, photos from late 2017 and early 2018 show net armor here. The T-90M also appears to have slat armor added to the rear of the tank to decrease the chances of a mobility kill. Fourth-generation Malachit ERA could later be fitted to the T-90M, but there are no pictures of T-90Ms with Malachit, and the first T-90Ms will likely be delivered without it. The gun’s accuracy is improved, but it remains a variant of the 2A46 cannon. The commander’s 12.7-millimeter machine gun appears to be a new design, mounted high up above the commander’s thermal sight. This is taller than earlier T-90s, and probably provides increased functionality similar to the American CROWS systems. The laser detection and — presumably — smoke deployment modules of the Shtora active protection system are retained, however, the active jamming “eyes” are removed. A possible reason for this is the Shtora’s ineffective nature against modern anti-tank missiles. 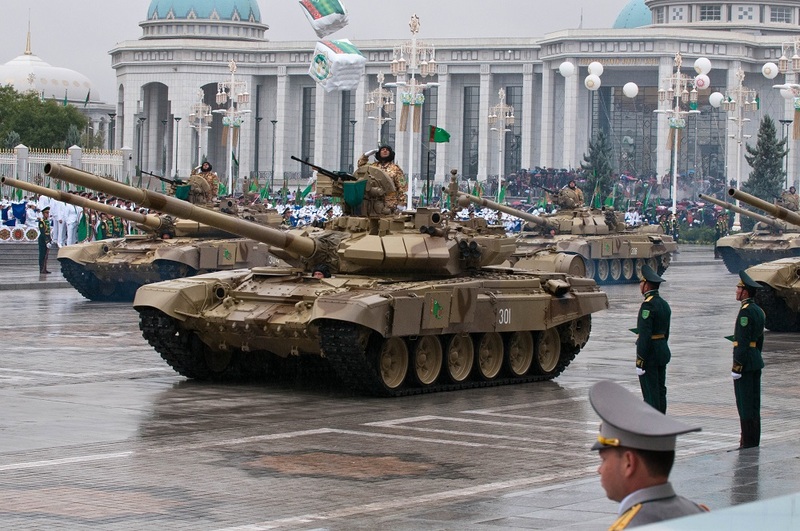 The Armata’s Afghanit APS could be later fitted to the T-90M later on, but there are no current pictures or evidence that Afghanit is being implemented on the T-90M. The T-90M also appears to feature increased creature comforts, including air-conditioning units. The driver’s station is modernized, changing from the harder-to-learn and -use levers of earlier Russian tanks into a yoke-type similar to that used on the M-1A2 Abrams. It features a diagnostic/logistic management system and improved radios. The M-1A2 SEP v3 includes many of the same upgrades as the T-90M — an unknown hull and turret armor upgrade, improved thermal imagers for the commander and gunner’s sights, and a revised CROWS system. Interestingly enough, the new CROWS for the SEP v3 is revised to be lower profile, whereas on the T-90M the profile of the remote weapon station is increased. While the actual cannon remains unchanged on the M-1A2 SEP v3, an ammunition datalink is added that allowed to use new HE MPAT rounds. The M829A4 APFSDS round is also included with the SEP v3 update, giving increased capability. It also includes the Trophy active-protection system. Like the T-90M, improved radios and logistical systems are part of the update. Comparing the two, the armaments are practically the same. While the ammunition datalink being part of the SEP v3 is reportedly an innovation, the Russians have fielded similar capability with the Ainet ammunition datalink since the T-90K in the early 1990s. Ammunition quality is probably relatively similar, although the new M829A4 is said to be able to defeat third-generation ERA packages, which would include the T-90M’s Relikt. The T-90M’s slat and net armor packages would have no effect on an APFSDS round, as they are geared towards HEAT-type projectiles. The T-90M likely uses the same “Svinets” rounds which have been in service since the 2000s, which are considered to be fairly lethal. The T-90M retains the ability to shoot the Invar gun-launched ATGMs, a capability the M-1A2 never really possessed despite the theoretical ability to do so with Israeli LAHAT missiles. In terms of detection, the M-1A2 is probably superior because of the third-generation domestic thermal imagers, compared to the T-90M’s foreign export imagers. Mobility wise, the T-90M’s lighter weight gives it increased operational mobility. In a fight, the M-1A2 SEP v3’s Trophy system would probably neutralize any advantage the T-90M’s Invar-M ATGM gives. The Invar’s speed of 350 meters per second is well within Trophy’s interception window, given that a Rafael states that Trophy is able to intercept HEAT rounds, which can travel in the range of 900 meters per second. Coming down to a gunfight, both tanks likely could penetrate each other and probably possess similar levels of gun accuracy. That said, the M-1A2 SEP v3’s crew is more likely to survive a penetration, since the ammunition is stored in an armored bustle separated from the crew with blowout panels in the rear of the turret. The T-90M partly retains the old-school Russian arrangement, with ammunition in the autoloader being placed around the turret crew. But some rounds have been moved into a separate compartment in the turret bustle with blowout panels similar to the Abrams, as the T-90M turret is significantly longer than a regular T-90 or T-72 turret. The victorious tank would likely be that with the more skilled crew.